Despite working in Brussels for 9 months, despite knowing that Bruges was my mother’s favourite city in Europe and despite not having been there since I was eight years old, somehow as an adult I’ve never quite managed to get on the train and visit Bruges in Belgium. Obstinacy perhaps? That ‘my parents love this place syndrome? 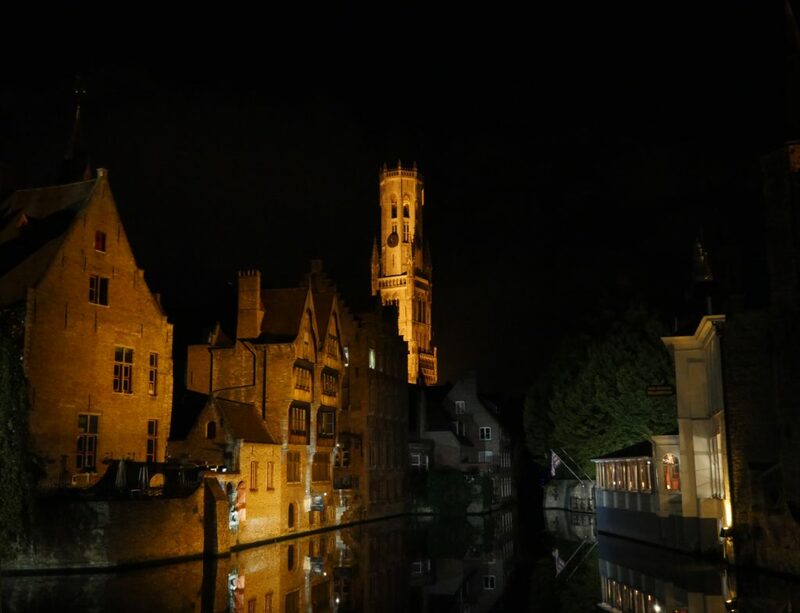 Whatever gremlin had pressed the ‘Not in Bruges’ button should have been long gone but it took an invitation from the local tourist board and a press event about next year’s Triennial Arts Festival to galvanise me into action. The railway station lies in the South East corner of the City but, it takes just 20 minutes to walk right into the historic centre – and nothing is more than half an hour’s walk. That said, there’s another rather fine option which might not help your orientation but which will definitely enable you to see most of the City in the hour or so that it takes. Right the way through Bruges there are canal boats with guides waiting to take you round. 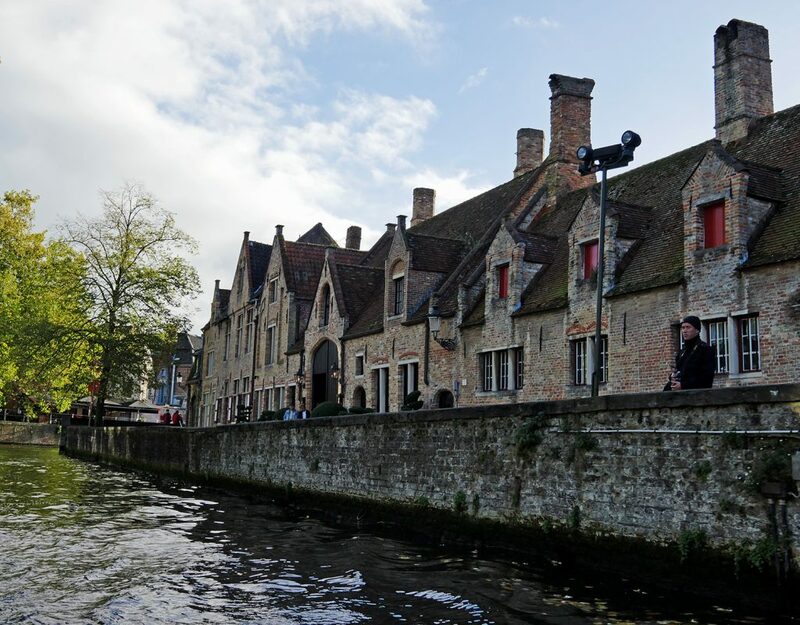 For eight Euros and thirty minutes of your time, you’ll get to see Bruges by water – and begin to understand why this pretty place is often called the Venice of the North. There’s more to that particular label though – the history of Bruges is fascinating, the so-called golden age of Bruges from the twelfth to the fifteenth century resulted from the City’s unique positioning, linking the Hanseatic port of the North with the southern trade routes. A cosmopolitan society, where traders from around the world were welcomed helped build this vibrant and wealthy City. When Philip the Good of Burgundy made Bruges his home, the city became a focus for the Arts and home to the Flemish school of art. At the height of his power, the most influential man in Europe, Philip helped to nurture the Golden Age – the fine arts flourished while stunning churches and a monumental town hall were constructed. The decline of the city after the death of Mary of Burgundy in 1482 owed much to the subsequent ruler leaving Bruges. At about the same time the Zwin channel, (the Golden Inlet) which had given the city its prosperity, also started silting and many of the international traders left. But, of course, the stunning medieval buildings remained and the entire City is now a Unesco Heritage Site. Of course, you can and you should walk around and take in some of those beautiful buildings. 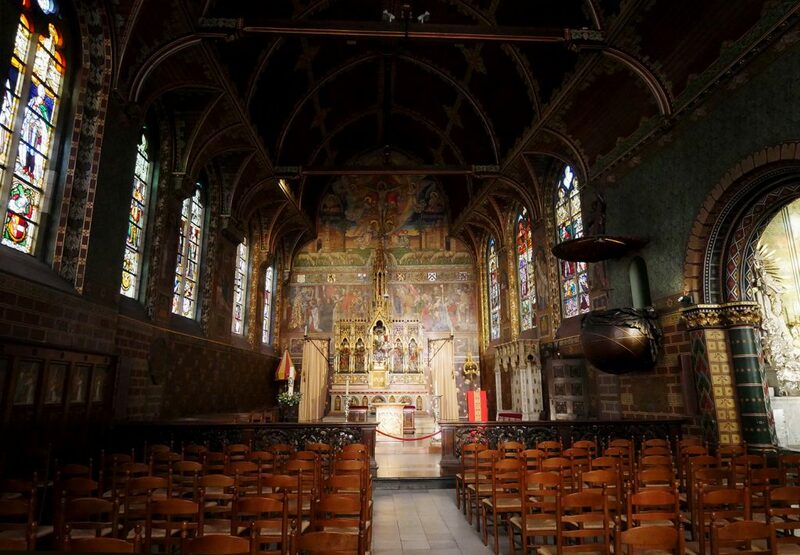 I was particularly fascinated by the interior of the 12th-century Basilica of the Holy Blood, which houses the Relic with the Precious Blood of Jesus, brought to the city by Thierry, Count of Flanders after the 12th century Second Crusade. The Relic is central to an annual event in Bruges, the Procession of the Holy Blood, Instituted in 1303, the ceremonial procession commemorates the deliverance of the city, by the national heroes Jan Breydel and Pieter de Coninck, from French tyranny in May of the previous year and which takes place on Ascension Day, as one of the great religious celebrations in Belgium. The event has it’s own UNESCO listing too. And, on my way to see the famous Madonna and Child in the Church of Our Lady, I popped into the building opposite to get my ticket. 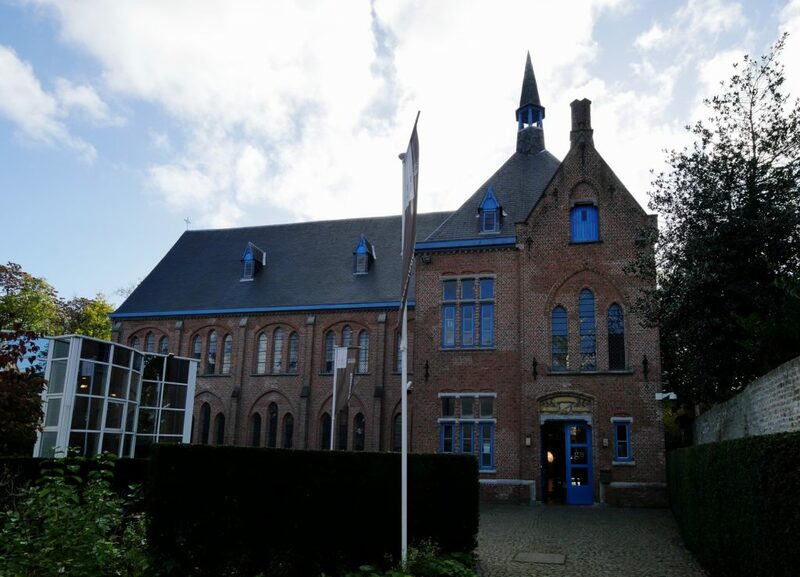 Clever planning there, it turned out to be Sint-Janshospitaal, one of the oldest preserved hospital buildings in Europe dating back to the 12th century. Today it houses a museum where you can learn more about hospital life in the past and how the wards would have looked then. 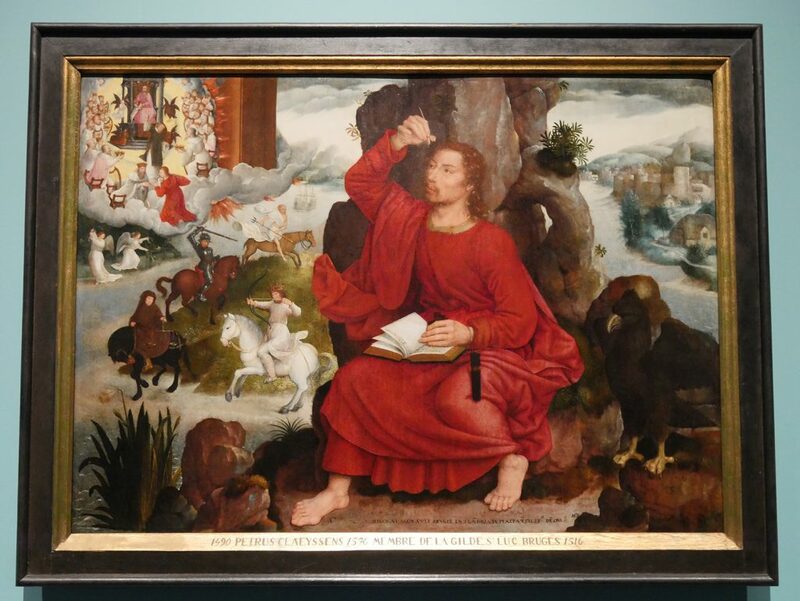 There’s an eclectic collection of furniture, paintings, sculptures, silverware, and pewterware and in the hospital chapel, the focus is all on the work of the most famous of the Flemish Primitives: Hans Memling. 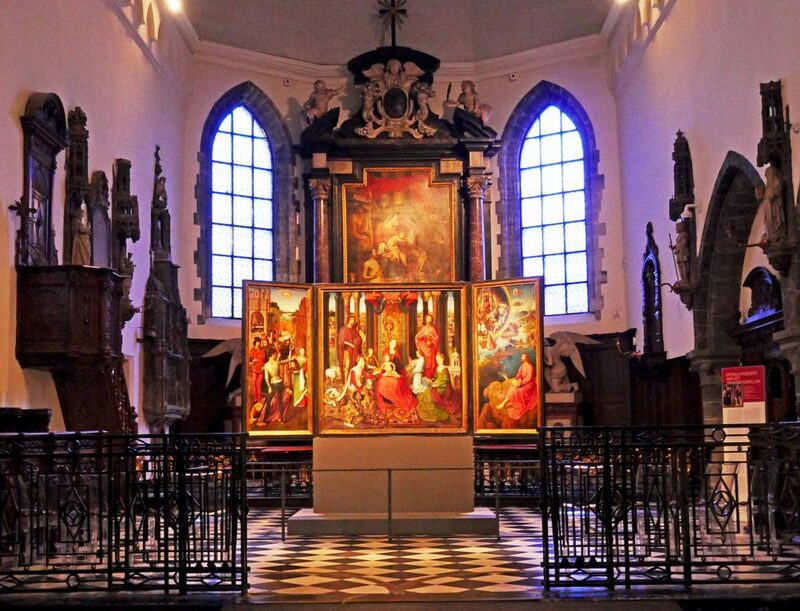 This painter lived and worked in Bruges in the 15th century and created his most important masterpieces here, including the famous Shrine of St Ursula, which was painted specifically for Sint-Janshospitaal. 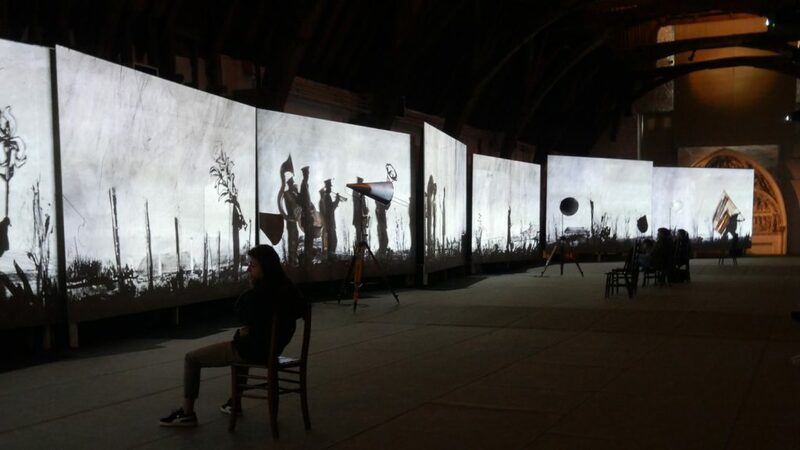 While I was there, very much in keeping with the theme of the Triennial, there was also an exhibition by William Kentridge ‘ Smoke, ashes, fable’ which runs until the end of 2018 and is organised around themes of trauma and healing. The centrepiece of the exhibition, a video installation ‘More Sweetly Play the Dance’ kept me and many others mesmerized. It’s a contemporary interpretation of the medieval Dance of Death which plays out in one of the larger rooms of the hospital. Next door, the Porter series of tapestries could have been created for the space, though they originate from Swaziland and the Stephens Tapestry Studio in Diepsloot near Johannesburg. As you can tell my stop to buy a ticket for next door turned into a much longer stay. The Church of Our Lady though is unmissable. From outside you can’t help but be impressed by its tower which at 115 metres (377 ft) in height, remains the tallest structure in the city and the second tallest brickwork tower in the world. 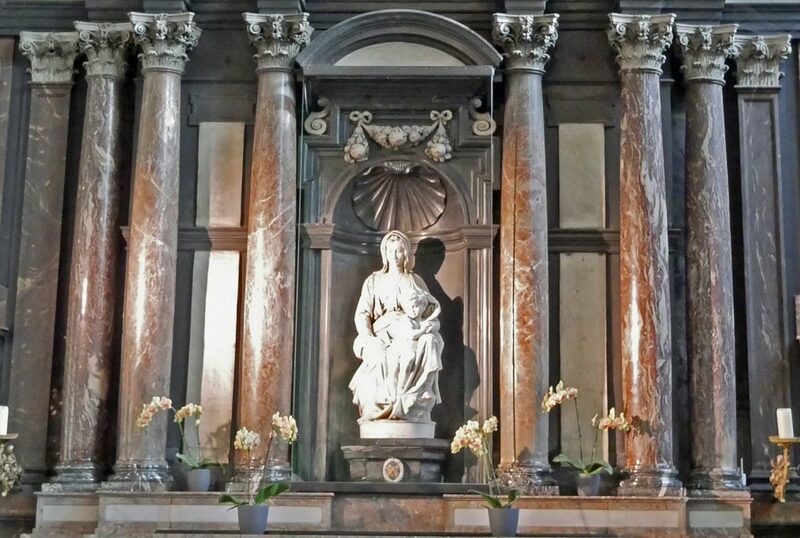 Inside, the famous Madonna and Child by Michelangelo Buanarotti was probably intended for the Cathedral of Sienna. But, such was the wealth of Bruges at the time (1504-5) that the work was bought by the Mouscron family and given to the Church. 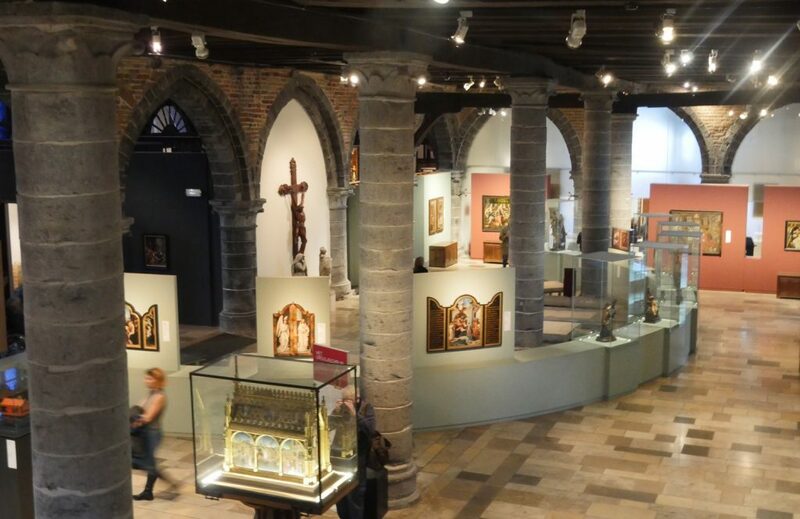 To put all of this in some kind of context I recommend stopping at the Groeninge Museum which houses a fine collection of works by the Flemish Primitives and goes on to illustrate 15th and 16th century Bruges with great visual eloquence. 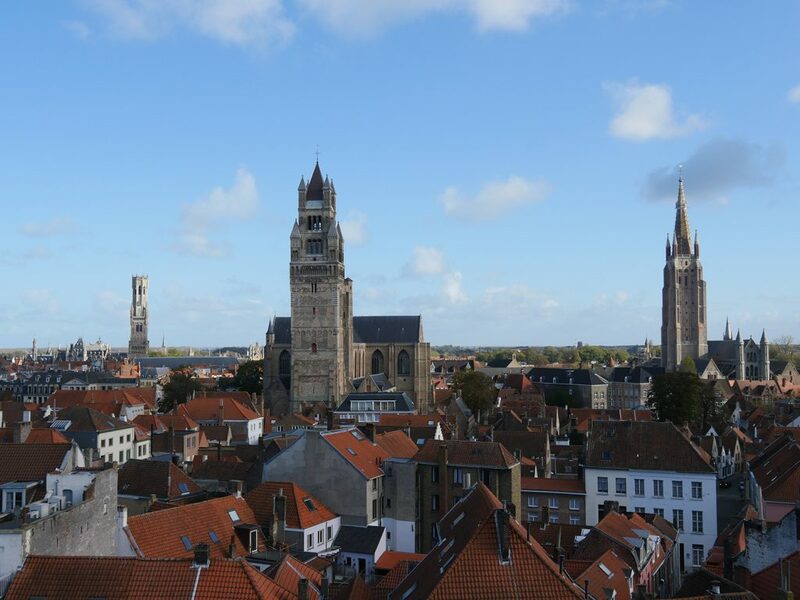 Throughout the 15th century, Bruges was one of Europe’s leading cities and the arts flourished. Not only nobility, but aspiring middle classes, merchants and visitors from overseas became patrons of the arts. 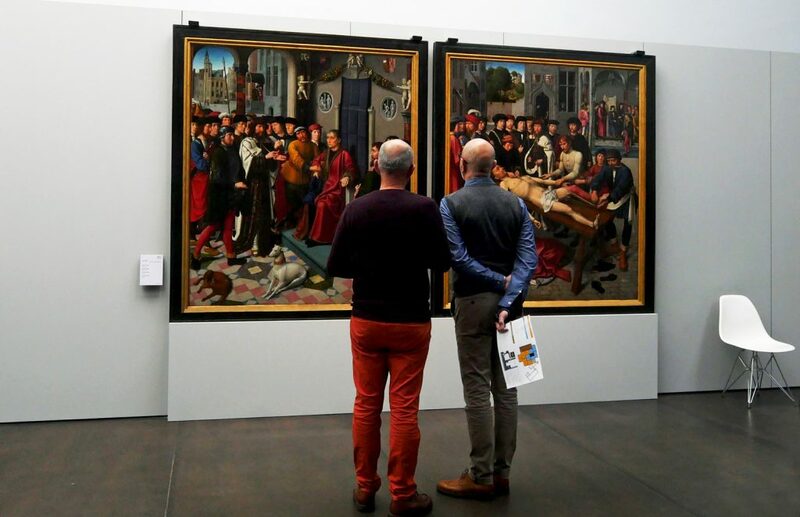 Some of the works of the Flemish Primitives illustrate the diversity of life in the city. 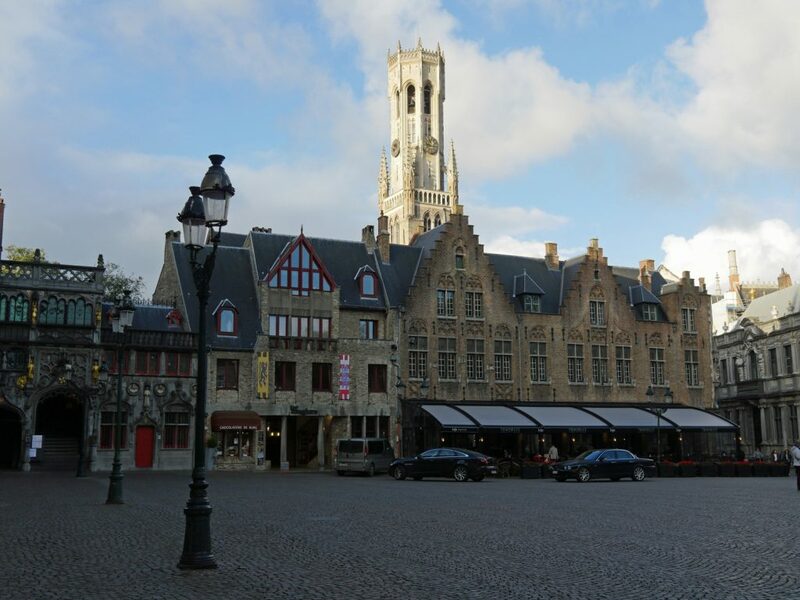 By the 16th century, the once flourishing city of Bruges was in economic recession. Home to both terrible poverty and great wealth it was a city of contrasts. 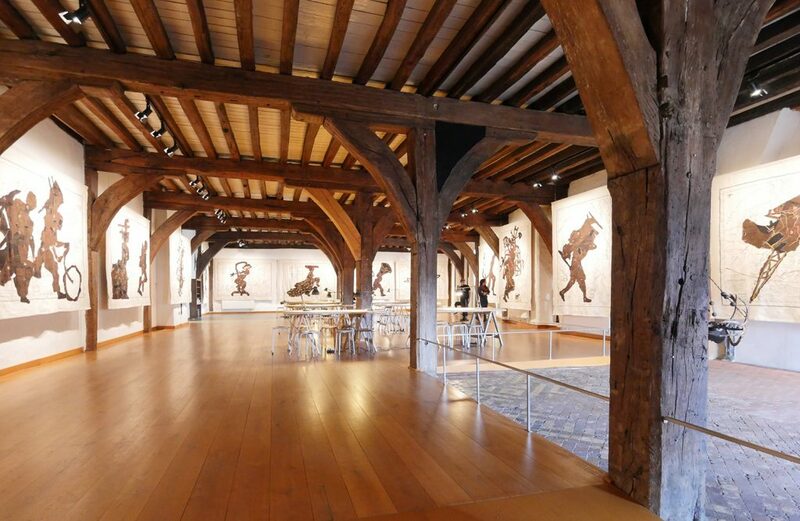 But, the remaining rich elite attempted to use Art as a way to emphasise the importance of Bruges as a trading centre. 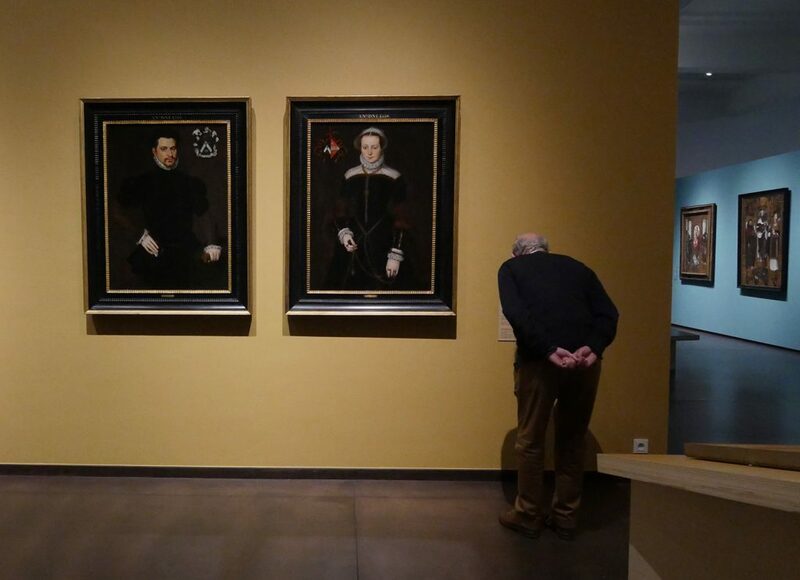 The museum currently has an exhibition of work by the artists of that time, the forgotten masters, including Pieter Pourbus Marcus Gerards, Pieter I Claeissens and his sons Gillis, Pieter II and Antonius which runs until the end of January 2018. 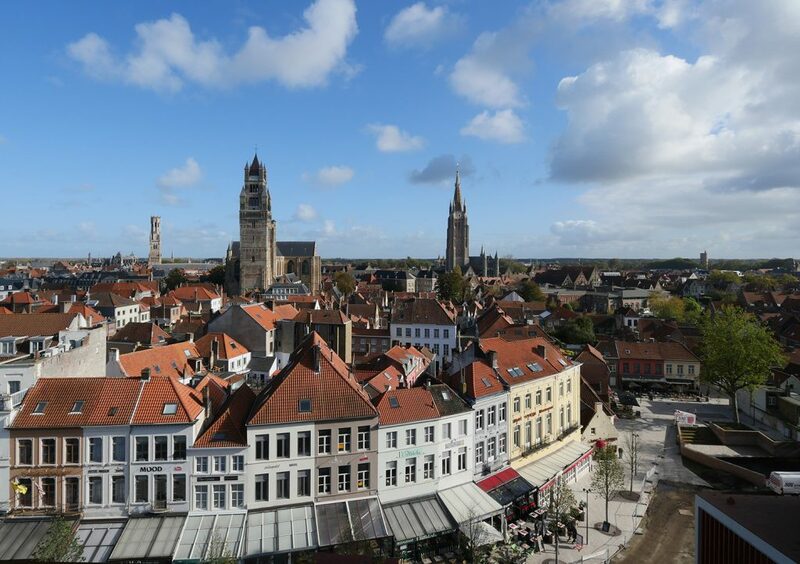 A fascinating way to bring the history of Bruges to life. To get a really good overview of the Bruges today though, I’d recommend visiting the Concertgebouw. Located at ‘t Zand, it was completed in 2002 when Bruges was European Capital of Culture. The architecture is quite stunning and was carefully planned to ensure that this ultra-modern building was still in keeping with the UNESCO heritage city. Take a tour of the building and explore some of the sound-art and contemporary artworks. And, finish on the top floor where the panorama over the city is spectacular. I’d like to have had more time to spend here. 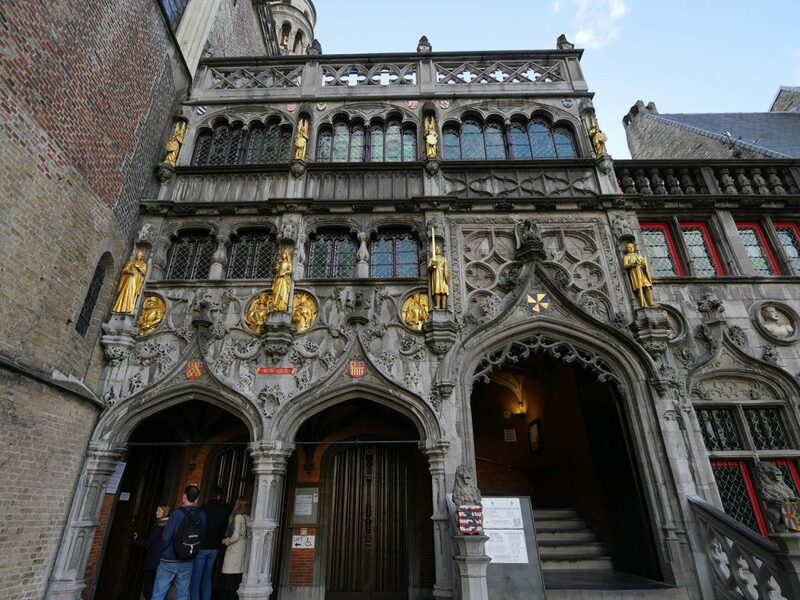 There are some great events planned for 2018 including a Renaissance Music Festival from 7th-13th May that will take place not only in the concert hall but also in historic locations throughout Bruges. 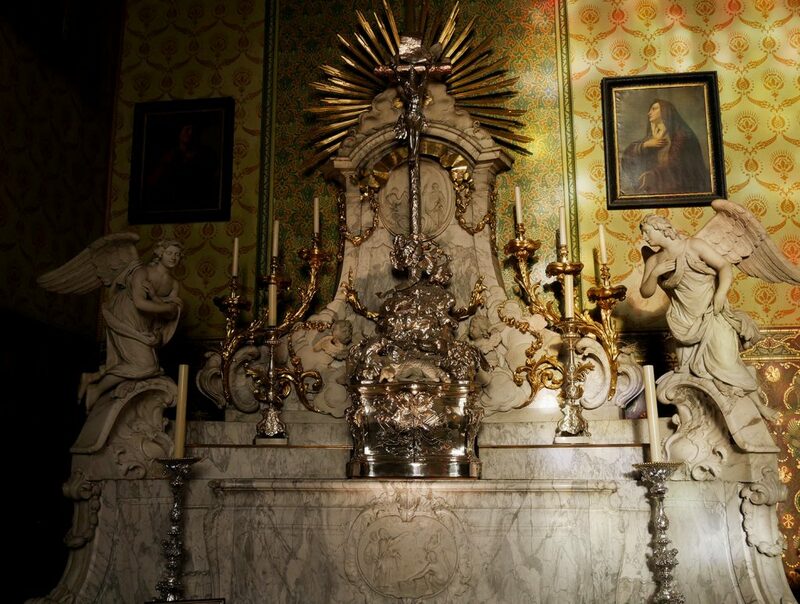 It is timed to coincide with the annual Procession of the Holy Blood, and will tell the story of Bruges fur trader and city official Donaas de Moor, the man commemorated by Jacob Obrecht’s remarkable Missa de Sancto Donatiano. 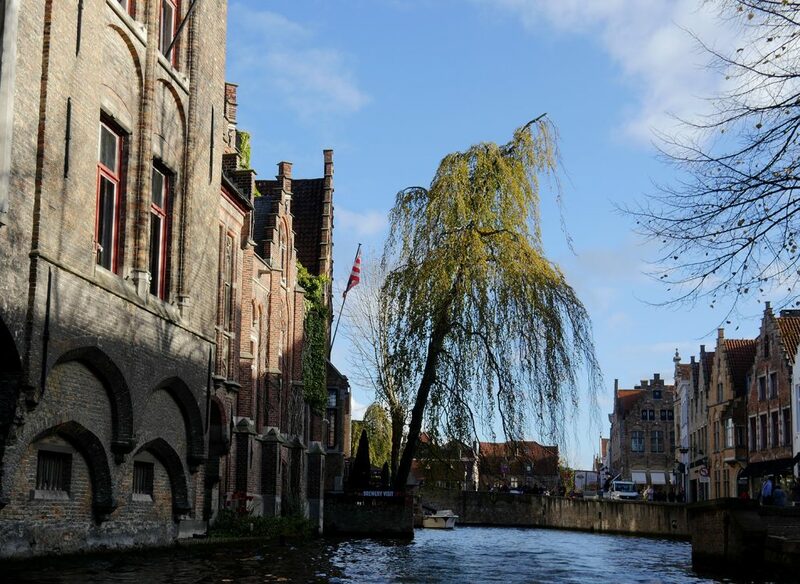 Take the side roads back to the centre of Bruges and you’ll be amazed by the wealth of artisan workshops and crafts shops. Of course, there’s chocolate. 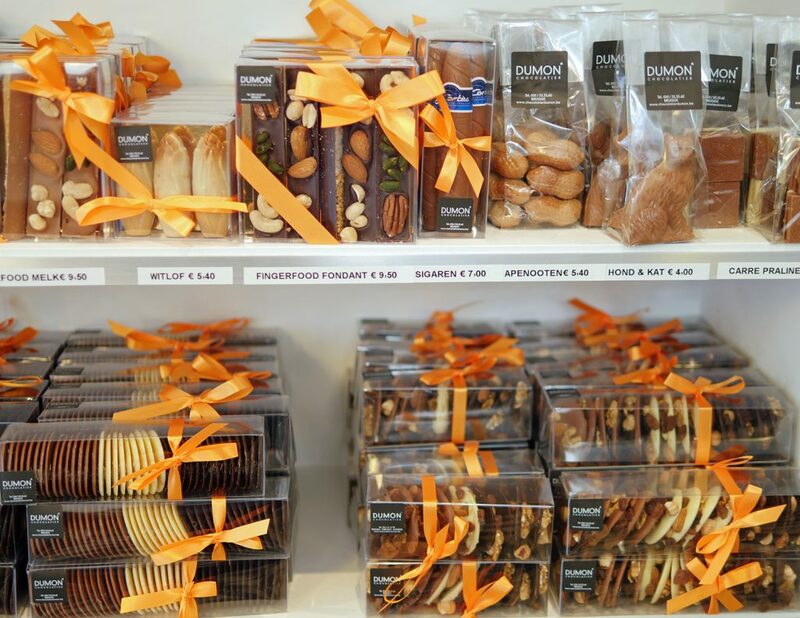 I tasted a lot and particularly enjoyed the fine chocolates of Dumon and the quirky products from the Chocolate Line, where you’ll find Wasabi, Cola and Chilli Pepper chocolates. 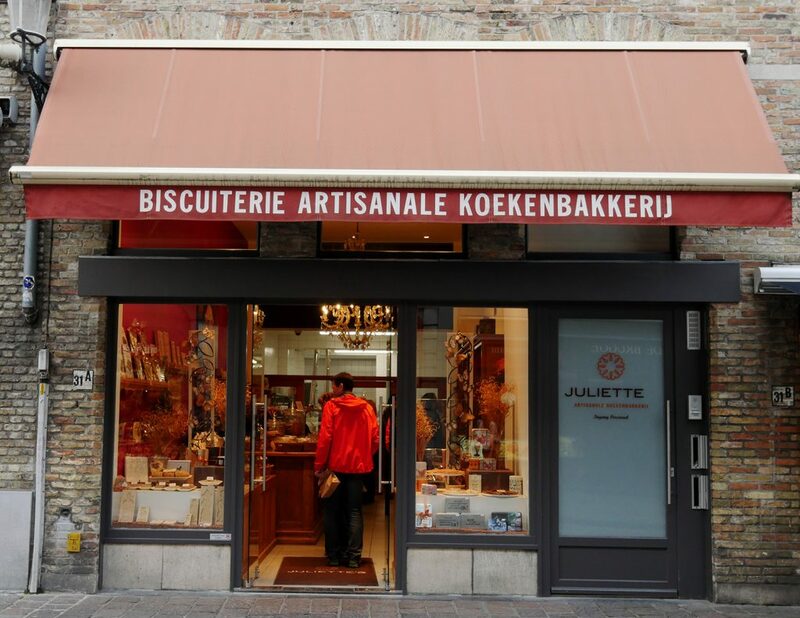 But, there’s plenty more that is handmade in Bruges – from the wonderful Speculoos and gingerbread at Juliette’s bakery to papermakers like Piet Moerman and letter sculptures like Pieter Boudens. 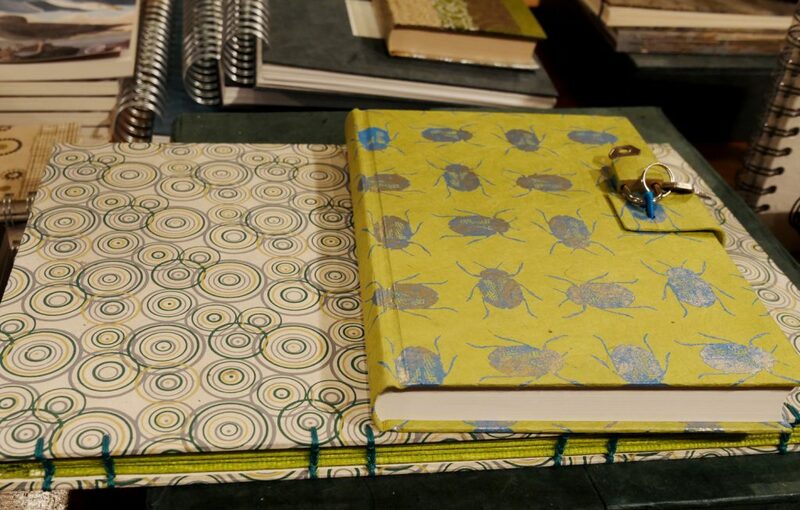 And, just round the corner from my hotel was the beautiful AlfaPapyrus – a shop selling handmade paper, books and calligraphy. There’s plenty in Bruges beyond Starbucks! In my next post, I will cover some of the culinary excellence you can find in the City. That is if you manage to avoid doing TOO much chocolate tasting along the way. 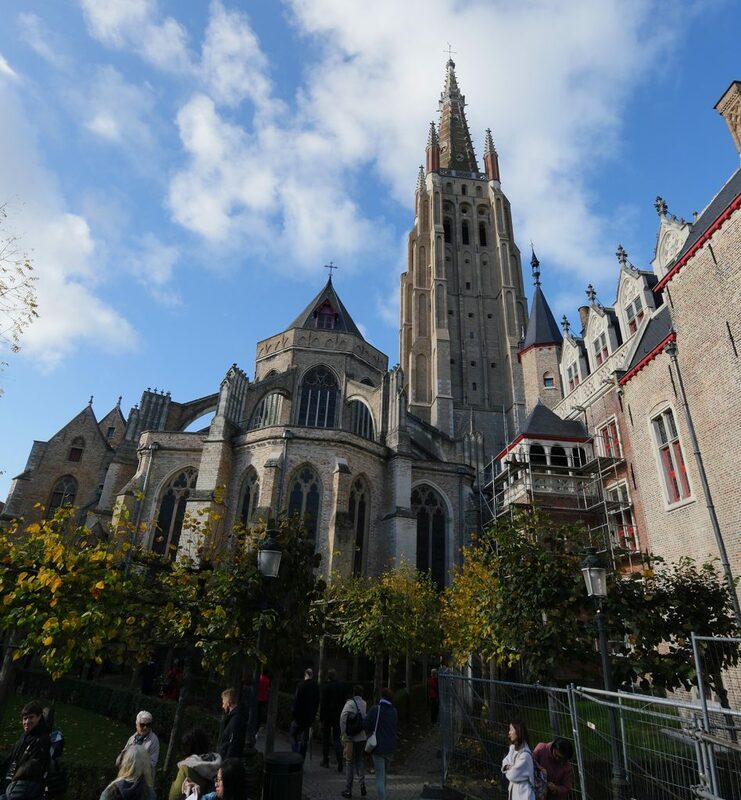 I travelled with Eurostar to Bruges via Brussels. Tickets start at £29 one way and the journey takes around 3 hours. 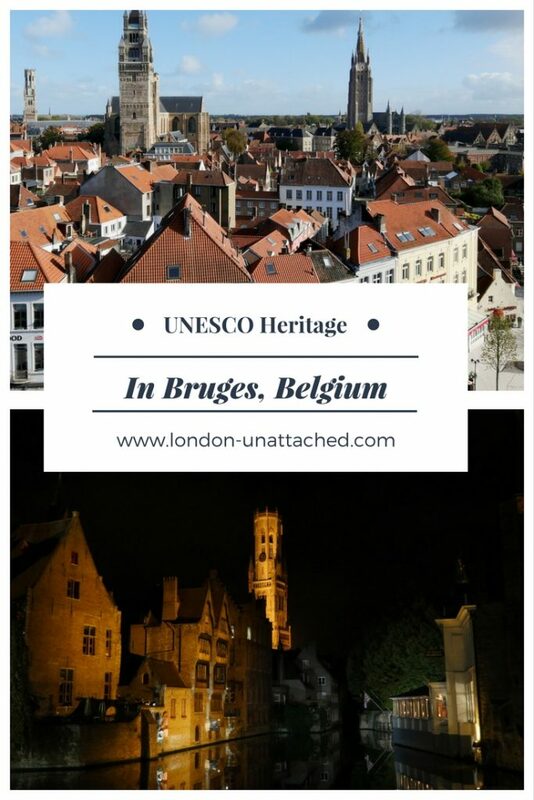 This is the best info on Bruges that I have read. Really interesting and I only wish 8 had read it before I went. So pleased t9 have read it now as it brings more meaning to the sights I saw. I shall have to go back ! 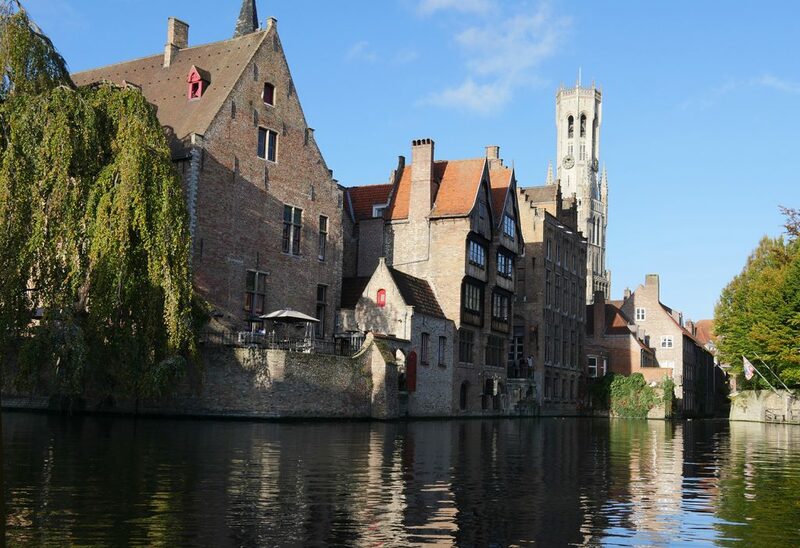 I’ve never been to Bruges but I do love the look of the architecture and all that art to see too, might have to look it up and arrange a little holiday. That train journey cost less than we pay to get from Somerset to London. This looks incredible. I really want to go….not just for the chocolate though!